« TalkCast 317 – Michael Mitchell Returns ! The absolutely charming Jackie joins us to talk all about her, her writing and the fun she is having. When she was 14 she had her first book, Bloody Nightmares, published. Now, at 16, she has her second book out, The Demonic Eye. We talked about how her love of words and reading was by her family and how libraries held such a fascination for her. 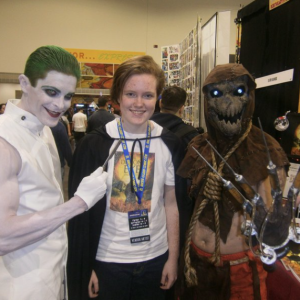 When not writing, going to school or deciding on which college to attend, Jackie attends comic conventions where she gets a real kick from meeting people. She really enjoys cosplayers. You can see her at Northeast Comic Con this summer.